I like weeks like this. 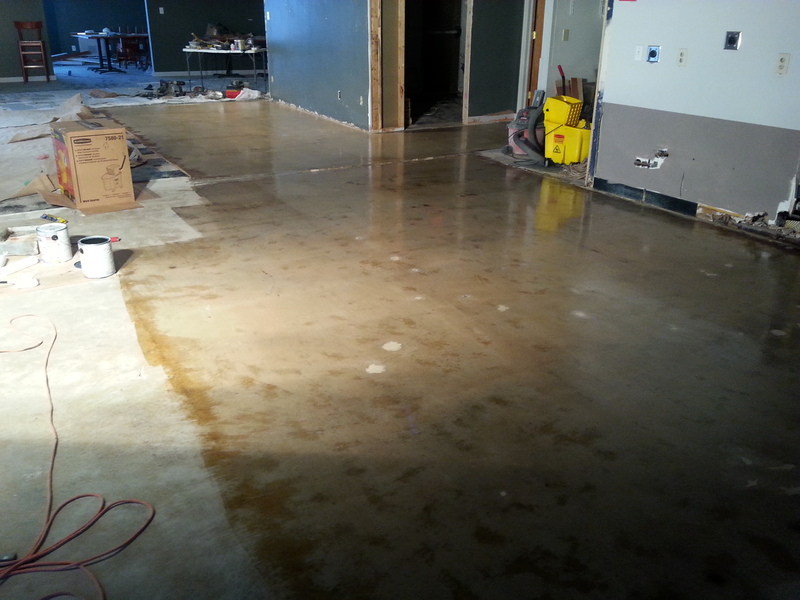 I finished up the floors…finally. I gave them a simple, inexpensive acrylic-polyurethane clear coat with a 1/4″ nap roller. 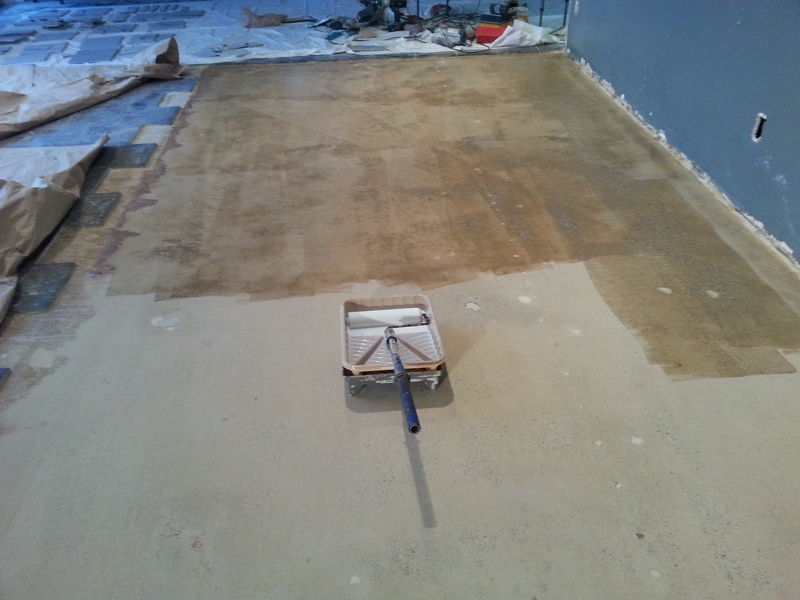 This took two coats and I used about a gallon and a half. It’s going to look nice. The natural concrete will have a lot of character. Now that the floors are done (for the fermentors coming in soon), I need to start building the walk-in cooler. This involves a lot of math so I right-size it the first time and don’t run out of room. Essentially I have to figure out the maximum throughput I will have with three 3.5 bbl fermentors given my current brew cycles and my best guess at lager/ale percentages. I do have room for another 1-2 fermentors so I have to keep that in mind. I want to have the option to stack three high and this will also be where I dispense too. With a 8′ x 15′ cooler, I will have the room for about 70 kegs max, well within my maximum monthly capacity. I found some online plans from a similar build using a ‘cool-bot’ so that I don’t need any expensive, large HVAC unit – just a regular window air-conditioning unit since the cooler is not that big. Retail value of this is about $2200 at Lowe’s. This is still far cheaper than buying a used one but I need to get this cheaper. 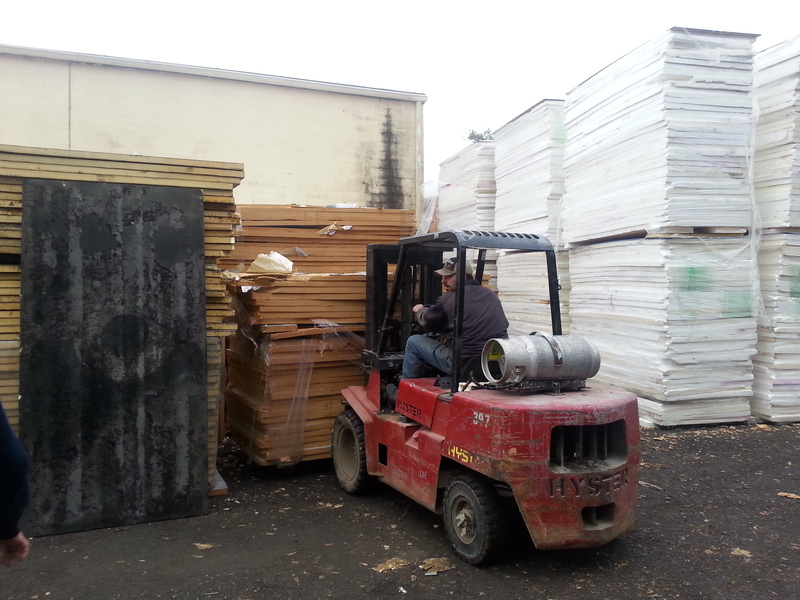 The 36 sheets of 2″ foam insulation board is about 60% of the cooler expenses. I found via Craigslist Akron’s ‘Insulation King’. He had the foam I needed – used and for 40% of retail – that’s a lot of savings! Since I have been recycling nearly everything (drywall screws and 2×4 nails included) I want this brewery to be green…at least as green as a brewery can be so recycled foam board was perfect. The 4×8 sheets of acrylic paneling that will line the inside is something I want to get cheaper too or find another alternative. Thanks Akron Insulation King! Saved me a ton of money. 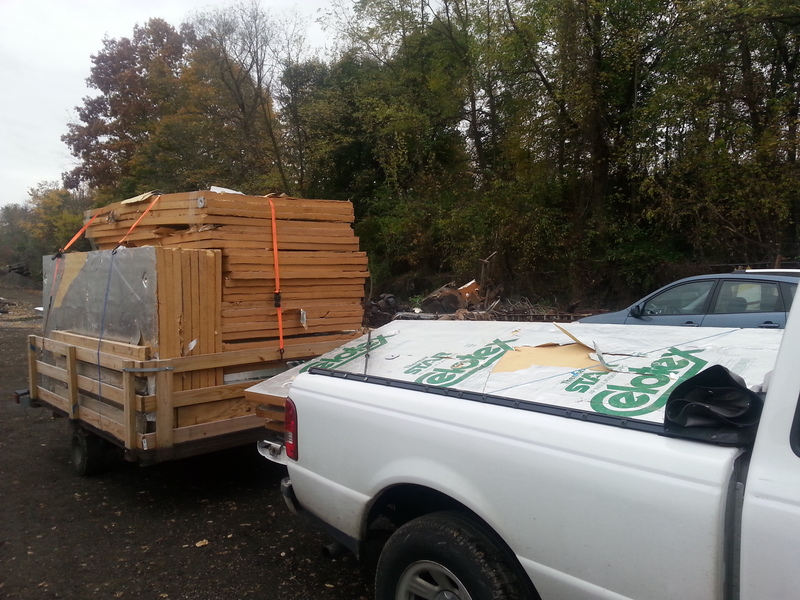 We drove slow…we did not want 44 pieces of 2″ thick insulation blowing away. Seems like a lot of insulation for a ‘little-ole’ cooler. 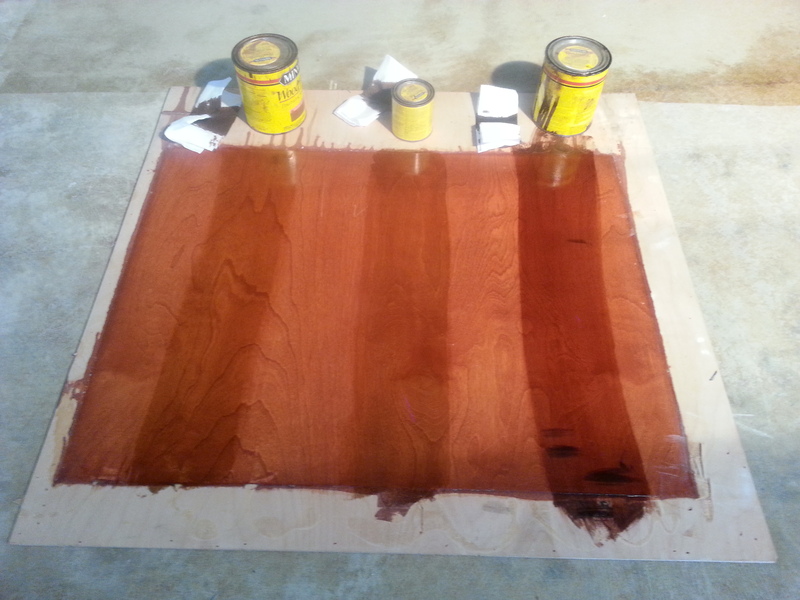 Lastly I started work on seeing if I can restain and varnish’ the current ‘red-stained’ wood paneling – something more brown. The testing is still a work in progress. I would rather not tear it down and replace just due to color. Comparing various stains over existing stain to ‘de-redden’ the current scheme. 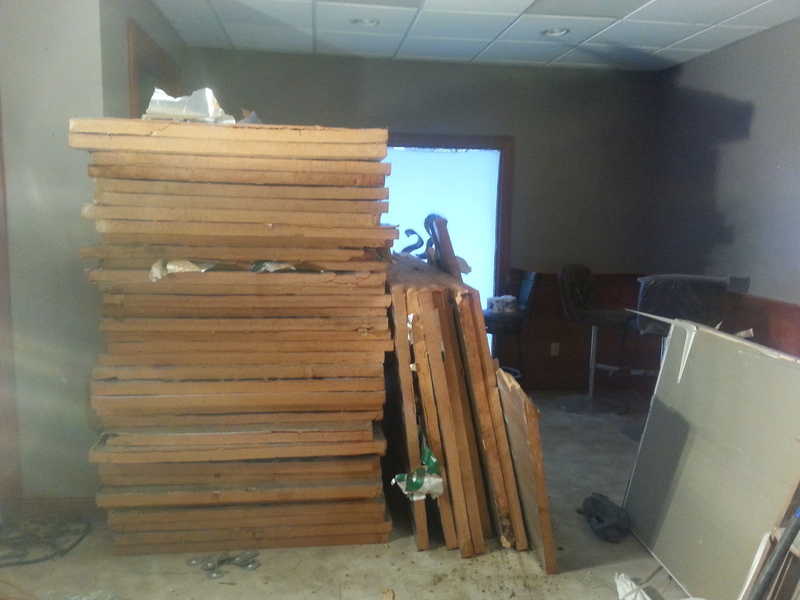 I continued work on my Ohio liquor license…about 1/3 done. I met with several people from local firms. I picked a security company, ADT and will be going with Time Warner for the other stuff. This is going in in a few days.